For locals in Norridgewock who weren't able to attend Cpl. Eugene Cole's funeral, they paid their respects their own way. 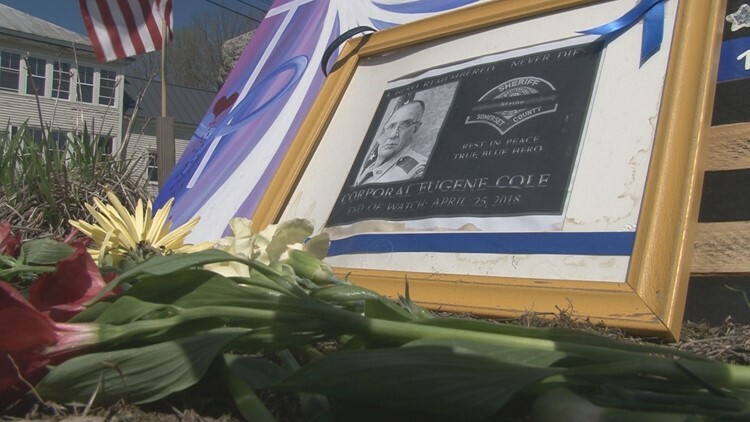 April 16, 2019 is day 357 of Sheryl Cole's life without her husband, Somerset County Deputy Corporal Eugene Cole. NORRIDGEWOCK, Maine — "From all of us you left behind -- we miss you. We love you. We learned from you. You tried to teach us how to live without you. I guess we never realized it would be so painful, so difficult." Nearly a year after Somerset County Deputy Cpl. Eugene Cole was shot and killed in the line of duty, his wife took to Facebook to pour out a heartfelt tribute to her late husband. April 16, 2019 is day 357 of Sheryl Cole's life without her husband. In one week, she says it will be a year since the two spent their last day together, arguing about plans to build a new house. Now, 51 weeks later, Sheryl says she has that new, beautiful house she and her husband had talked so many times before, thanks to the people in her community who donated hours of their time and services. "I have blue lights in the windows and blue lights on the outside," Sheryl wrote. "They’re to honor you, of course, and all law enforcement, firefighters, first responders, and dispatchers to show our support for the heroes that are still out there everyday and for the ones who no longer can be. But they are also to show how we feel now that you are no longer with us." Cpl. Cole died on April 25, 2018 after encountering John Williams while on patrol in downtown Norridgewock. After a four day manhunt, Williams was arrested and charged with Cole's murder, the indictment stating he shot and killed Cole with a 9mm Ruger handgun. Williams plead "not guilty" to the charges, despite a confession at the time of his arrest. He has appeared in court multiple times this year, trying to get his confession thrown out. Cpl. Cole was the first officer shot and killed in the line of duty in Maine in almost three decades at the time of the incident. Since then, Sheryl has been learning how to do life without her husband. I come home to an empty house. I cry when I look at the lone coffee cup in the sink, for it reminds me of all the talks we had over coffee. I watch Jeopardy alone and miss that smug grin on your face whenever you got the answer right. It makes me sad when I do laundry, for there are no uniforms that have to be ironed and dressed. When I clean the floors, there’s no clumps of mud from your boots. There could be a hundred bridges or roads named in your honor, and they would not be reminders. For me, those reminders are a thousand little things I see and do everyday, but now I see and do them alone. Grief is a very strange thing. I’m not happy, yet I’m not unhappy. I don’t want to die, yet I’m not afraid of death. The tortuous pain is sometimes unbearable, yet I can function. Sometimes I want to be miserable and miss you, and that’s okay. I’m alone, yet I’m not lonely. Most of this is because of our children, our grandchildren, and our great grandchildren. Our first born son is named after you. Our first born grandson is named after your brother. Our first born great grandson is named after you. Your name will live on forever. I am ever so grateful for that. And people around Maine are making an effort to ensure Sheryl's words ring true. Last week, the Redington-Fairview General Hospital in Skowhegan decorated a new ambulance with Cpl. Cole's badge number as a tribute to the man who gave so much to his community. "We’re doing all right. We miss you. I can deal with the pain, for I’ve accepted it will be inside me until we meet again. Please know how much I love you, how much I miss you, how much I want you with me, with our family," Sheryl wrote toward the end of her post. "You will not be forgotten, ever. We have your memories, and they are good. Good will overtake the bad, eventually. We just need to pray for patience until that day comes."